I See Me!, Inc launches a new personalized children's book that aims to commemorate a child's first Christmas. 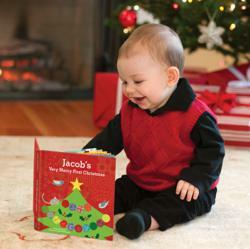 How can you make a baby’s 1st Christmas extra special? Children’s book publisher I See Me!, Inc. announces the release of My Very Merry Christmas, a new personalized children's book that celebrates baby’s 1st Christmas with the baby’s name featured on the cover, throughout the story and even incorporated into the illustrations. It is one of the very first personalized children’s board books with sturdy pages that has ever been published in the USA. This charming story, written by award-winning children’s author Jennifer Dewing, features adorable animals that prepare for a very merry Christmas for the baby. This customized children’s book features charming illustrations of Goose, Chipmunk and other furry friends who deliver a note to Santa, letting him know that the baby is about to celebrate his or her first Christmas. At the end of this delightful story, the animals circle the tree that they have adorned with the baby’s name spelled out on the ornaments. I See Me! has a free virtual tour of the book available on their website, and can be ordered online or by phone. I See Me! 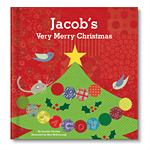 Inc. creates high-quality books personalized with the child’s name in the story. Maia and Allan Haag’s mission is to increase self-esteem in children through personalized children's books that celebrate the uniqueness of each child. For more information or to take a free virtual tour of the children's books, visit ISeeMe.com or call 1-877.744.3210. All books are backed by I See Me!’s 100% satisfaction guarantee.